What you're viewing below is a pic of my colleague; this was taken in a team trip. Hmmm nice I know; one of my other creative colleague is getting bored. 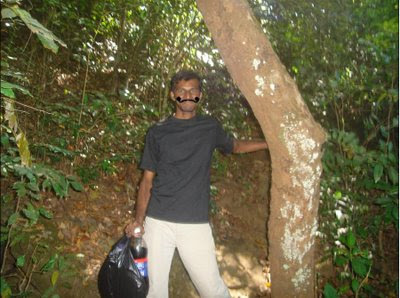 And the victim is the pic.. Look below; Sends mail to the entire team with subject "Veerappan in the making"
There is 30 min of discussions and laughter; when finally people are getting back to work mode he mails one more. 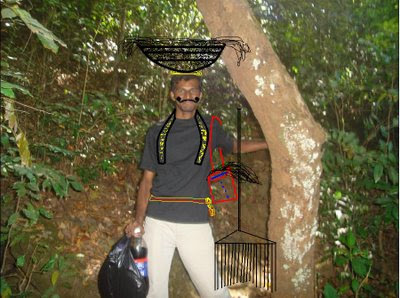 After Veerapan’s death, still his Sweeper………………..is in jungle, we got pics of him. :) :) "
Now this is what happens when people are getting B.O.R.E.D. In case I dint mention, all this happened a year back! I am posting it now! Why??? Duh, what did I just say? People Get Bored :) and so did I! paapa...amaayaka sikkidre heega maadodu....enri neevu....aa hudga nimna edrhaakolakku aagalla...haakondre badukiralla...haagantha heli heegella maadbahudu...idhu nimge nyayana?? Shedding weight = Losing Brains?